The minute I saw this recipe for Ziti With Pumpkin and Sausage I knew I wanted to try it. For several reasons. 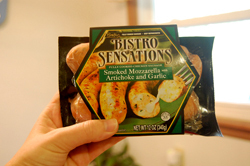 One, my husband loves grilled chicken sausage especially the newer varieties like the one shown here. Two, I seem to be attracted to anything made with pumpkin and lastly, even though this recipe is made with pasta and sausage, the ingredients are lower in fat and calories. So I printed the recipe and stuck it away for the perfect opportunity which came two nights ago. It was cold and rainy outside and I needed a recipe that called for ingredients I already had on hand. My family absolutely loved this recipe. I changed things a bit which I'll tell you below but even if I had made it exactly as the recipe suggests it would have been outstanding. I hope your family likes it as much as mine. Combine pumpkin, flour, garlic powder, salt, nutmeg and cayenne pepper in medium skillet over medium heat. Slowly add evaporated milk, stirring until smooth. Cook, stirring occasionally, for 2 to 3 minutes or until mixture begins to thicken slightly. Pour over pasta in pot. Add sausage and reserved pasta cooking water; stir well. I used Bistro Sensations sausage, the Habanero with Monterey Jack Cheese variety, that I found at Walmart. It added just the right amount of spice without being overpowering. Spread half of the pasta mixture into prepared baking dish. Top with spinach. Cover with remaining pasta mixture. Lightly spray piece of foil with nonstick cooking spray. Cover ziti with foil, greased-side-down. Bake for 20 minutes or until heated through. Combine mozzarella and Parmesan cheeses in small bowl. I also added some shredded queso cheese so I had about 2 cups total. Remove foil; sprinkle with cheese mixture. Bake, uncovered, for an additional 5 minutes or until cheese is melted. This would be great served with one of our salads like Strawberry Salad w/Caramelized Nuts. I am quite certain that I will be making this recipe over and over again both for my family and for large gatherings. It would be a great addition to any buffet or sit down dinner. Click here for more Easy Recipes.